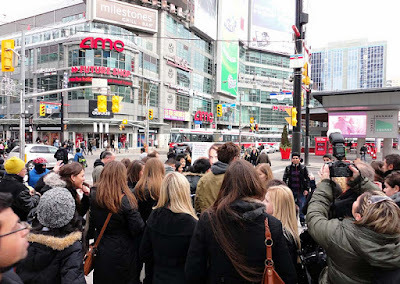 Happy fans and media gathered around actress Megan Park as she unveiled the new PETA advertisement at the #Toronto Eaton Centre today. The bustling crowd surrounded the Canadian star of the ABC series ‘the Secret Life of the American Teenage’ where she plays cheerleader Grace Bowman. The group made a nice addition to the usual characters that you can find down at one of Canada’s busiest intersections – Yonge and Dundas Streets.